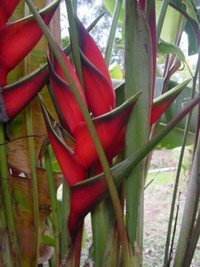 A tropical marvel, the genus Heliconia. 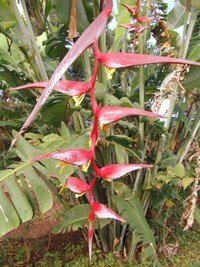 For the ones of you who have had the chance to travel to Southern Mexico, the Caribbean, Hawaii, Singapore, of for that matter almost any tropical location you could not but stop in your tracks when facing a blooming Heliconia plant and for the ones who never went there here is a chance to enjoy those jewels at low cost. 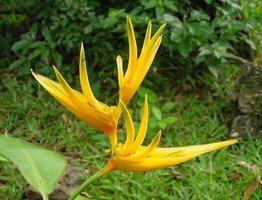 The genus Heliconia is the sole and only one within the Heliconiaceae family which was created by taxonomists to distinguish it from the Musaceae family (the banana trees) where it was formerly classified. Those plants do obviously share some common features and actually belong to the Zingiberales order (a classification rank one step over the families). This order groups eight families which are besides the already two mentioned; the Strelitziaceae (birds of paradise and traveler's tree), the Lowiaceae (no common name and quite rare), the Costaceae (costus or spiral gingers), the Zingiberaceae (gingers, ginger lilies, torch gingers), the Cannaceae (cannas or Indian shots) and the Marantaceae (prayer plants). Most of those plants display large leaves hold on long petioles and inflorescences with colored bracts hiding the small flowers, all grow from a rhizome which is no more than a subterranean stem. 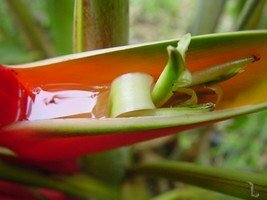 They also are of tropical origin and have a rather important economic role, either because of the fruits (bananas), the edible or medicinal rhizomes (gingers, arrowroot), cut flowers (strelitzia, heliconias) or potted and garden plants (cannas and many others). But let us get back to our subject, the heliconias. As stated above this is a solitary genus but also a prolific one as it has about 250 species (probably a few more still to be discovered) and man has created a large array of hybrids, an endless occupation for horticulturists and enthusiasts. As mentioned in the introductory paragraph those jewels can be enjoyed all over the tropics, from Asia to America through Africa and Australia but where do they originate from? 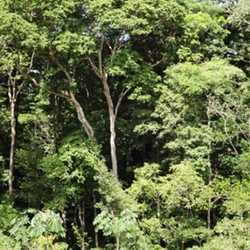 As a matter of fact the geographical origin is restricted to tropical America, roughly Mexico to Bolivia and comprising islands of the Caribbean. A rather intriguing fact, still unsolved by specialists is the fact that some five to six species are endemic to a completely different part of the world, namely the large territory going from Samoa islands to Indonesia. All species and varieties found there have green bracts and flowers, thus are much less showy than the American species which display bright colors and give them such an attractive power. 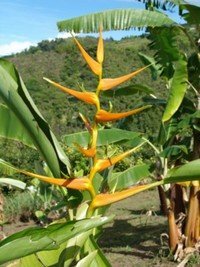 Technically speaking, heliconias are herbs as they do not produce any woody cells which does not prevent some species to reach several meters in height; therefore they are erect herbs which is also the term used for banana trees. 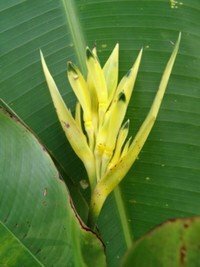 And just like banana trees they produce what is known as ‘pseudostem' bearing leaves and inflorescences. Leaves are often large and long, glossy green or sometimes maroon to reddish and are disposed oppositely on the stem thus giving a kind of flat aspect to the plant. 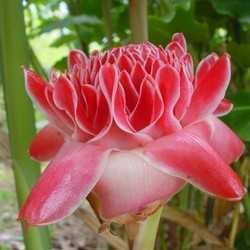 The most impressive and sought after part is of course the inflorescence. 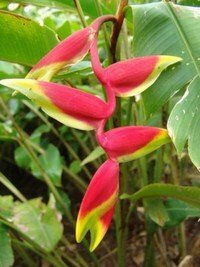 This one is either pendulous (Heliconia rostrata, H. collinsiana) or erect (H. latispatha, H. caribaea) and made of a peduncle to which are attached colored bracts (modified leaves) which can be red, yellow, orange, pink, green, stripped and protects the true flowers. Those flowers are rather tiny, composed of three sepals and three petals often yellow or whitish and stay open for just one day. 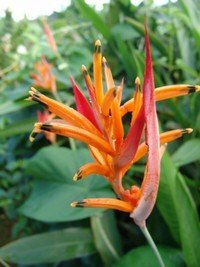 They are visited by hummingbirds and other birds which act as pollinators for all American species while heliconias species of the Pacific and Asia rely on bats. 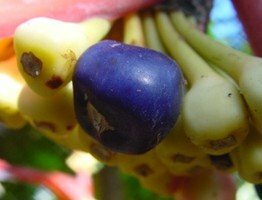 When pollinated they will produce a fertile seed set in a bright blue (American species) or bright orange (Asia-Pacific species) fruit which color calls the attention of birds or other animals that will act as dispersing vectors. Heliconias can be grown by enthusiasts, either outdoors in the tropics or indoors in less favorable climate but they can be kept all year in the garden provided it never goes under 40°F (4°C). Most species will survive this cold, which means that though the aerial part will be destroyed, the rhizomes can take it provided they are covered by some kind of mulching and are in well drained soil that will not retain humidity. Aerial parts will be preserved if the plants are protected in glass house or conservatory where temperature is between 60°F. (15°C) and 70°F. (20°C). In tropical areas one will notice a decrease in growth during the cooler and drier part of the year while active growth will of course take place when the warmer and rainy time of year starts and blooms will be in the wet. Those plants are quite easy to grow, all they need is heat, water and loose rich soil. 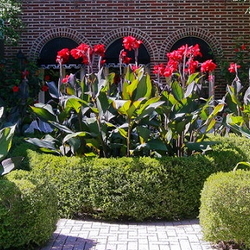 The soil has to be loose enough so the rhizomes can easily grow shoots and roots and also allow water to run freely, heliconias do enjoy water but will not like stagnant water that will soon cause rotting. It is therefore strongly recommended to loosen up soil if it is compact by mixing it with pine bark, peat moss, wood shavings, sand, gravel or any available material that will do the trick. Some well matured manure can be added and will profit the plants but too much will tend to produce active vegetative growth and little flowering. Propagation is usually done by slicing the rhizomes just like for gingers; seeds can be sown but are not so easy to find and will of course require more time to produce a mature plant able to flower. It is nowadays quite common to find those plants in nurseries and they are always worth a try, just make sure to choose the correct size of growth corresponding to the room you can offer, if well cared they will grow at an amazing pace and reward you for your efforts!